Neonicotinoids, a class of insecticides frequently used in agriculture, gets plenty of bad press for killing pollinators like honeybees. But they’ve also emerged as an important combatant of the emerald ash borer, an invasive insect that has devastated ash populations all over the United States with the highest risk localized to the American Midwest and the northern half of the Eastern seaboard. For pollinator protectors in Michigan, that’s a problem. With the recent designation of the rusty patched bumble bee as endangered by the U.S. 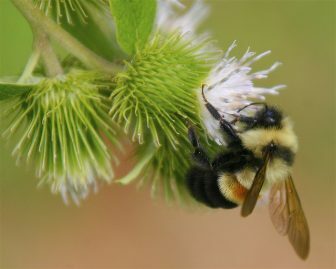 Fish and Wildlife Service – the first time any bee species in the U.S. has landed on such a list – the race for effective conservation tactics has accelerated. That includes proposed bans on neonicotinoid use for personal and professional application. They draw upon recent studies linking neonicotinoids to instances of colony collapse disorder in honeybees. The disorder occurs when most worker bees abandon an otherwise healthy hive. Former Michigan Rep. Gretchen Driskell, D-Saline, introduced a bill last November that would have banned on neonicotinoids. It focuses on a class of the insecticide found in the majority of those used against the emerald ash borer. “We introduced this legislation kind of thinking that it’s a pretty harsh bill but a good starting point to have the conversation to maybe tailor it more to specific purposes than an all out ban,” said Annika Doner, the legislative director for Driskell. Similar bills are proposed around the U.S. as part of pollinator protection plans. Maryland is the first state to ban consumer products containing neonicotinoids such as weed killers sprays and other lawn control products. It is slated to go into effect at the start of next year. The law still allows certified parties such as farmers and veterinarians to continue using products with these chemicals, but environmental activists are celebrating the partial ban as a crucial first step. Entomologists remain on the fence. “I do think that the situation with neonics can be complex,” said Deborah McCullough, a professor of entomology at Michigan State University and co-author of “Insecticide Options for Protecting Ash Trees from Emerald Ash Borer,” a book funded in part by the U.S. Department of Agriculture and the National Institute of Food and Agriculture’s North Central Integrated Pest Management Center. Ash don’t rely on flowers to help them reproduce, limiting direct exposure to pollinators. However, there is concern that the repeated application of neonicotinoids to ash increases the chance of it affecting bees and other pollinators in less obvious ways over a longer period of time. Since 2002, when the emerald ash borer was first discovered in Michigan, neonicotinoids have been used to treat infected ash trees. Part of this practice, McCullough said, was due to a scarcity of other treatment plans. Today there are other insecticide options to tackle emerald ash borer that may pose less of a threat to pollinators, McCullough said. Recently, more and more professional applicators have switched from neonicotinoid based pesticides, which require annual sprays and trunk injections, to emamectin benzoate based products which only require tri-annual application, according to McCullough. 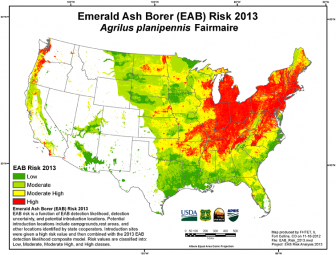 Still, the conflict between pollinator protection and emerald ash borer eradication remains. An EPA summary of its registration review for emamectin benzoate published in 2011 noted a data gap in the ecological toxicity database for emamectin benzoate. The EPA’s timeline for the review states that it will issue a decision on emamectin benzoate this year, following a three month public comment period that ended December 2016. Those developing Michigan’s Pollinator Protection Plan have no intention of banning consumer products containing neonics, said Jeffrey Zimmer, the deputy director of the Michigan Department of Agriculture and Rural Development’s Pesticide and Plant Pest Management Division. Meghan Milbrath, a research associate within Michigan State’s Department of Entomology who is helping develop that plan, suggests using neonicotinoids conservatively. Pest management strategies that employ cultural, physical and biological controls should be tried first, she said. Another problem further complicating the neonicotinoid debate is sublethal effects, she said. Sublethal refers to factors outside of neonicotinoids that contribute to the honeybee’s struggles. The waxy makeup of hives gradually accumulates heavy metals, pesticide dust and other contaminants over time. The build up weakens the immune system of bees, the effects of which can be seen in emerging infectious diseases that afflict them. Environmental pollutants also inhibit bees’ dance communication and their ability to navigate back to their hives after foraging, Milbrath said. Habitat loss further diminishes the available nutrients for bees, creating a web of threats in which neonicotinoids are but one factor. It is why the Michigan Pollinator Protection Plan Committee is hesitant to go after neonicotinoids in earnest. Pesticide labeling will still be a prominent component of the pollinator protection plan, Zimmer said. But that’s something Milbrath also expresses concern about. The committee will have a draft of the plan available for public comment between March 10 and April 14. You can sign up to receive updates on the Michigan Pollinator Protection Plan. Correction: A prior version of this story misidentified Jeffrey Zimmer as the deputy communications director of the Michigan Department of Agriculture and Rural Development. His title has been fixed in the story above. Editor’s Note: A clarification to this story was added on Tuesday, February 14, 2017 that notes professional pesticide applicators have been shifting towards using more emamectin benzoate based pesticides over neonicotinoid based ones. While Imidicloprid was included in the study published by Deb McCullough, no one uses it for treatment of EAB anymore as far as I know. The product of choice is emamectin benzoate (Trade name TREE-age) and is NOT a neonicitinoid, it’s a macrycyclic lactone . It still has bee toxicity though. The article is misleading as it refers to treatment of EAB using neonicitinoids, which is not true. There may be rare exceptions by uninformed companies. I’ve personally treated over 2,800 Ash trees in the last 4 years with TREE-age.